Classical (or "early") Greek philosophy focused on the role of reason and inquiry. In many ways it paved the way both to modern science and to modern philosophy. Clear unbroken lines of influence lead from early Greek philosophers, through early Muslim philosophy to the Renaissance, the Enlightenment, and the secular sciences of the modern day. 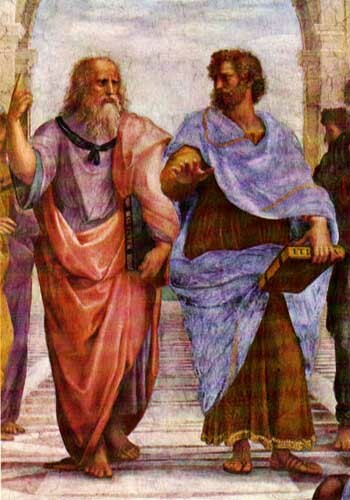 The history of philosophy in the West begins with the Greeks, and particularly with a group of philosophers commonly called the pre-Socratics. This is not to deny the occurrence of other pre-philosophical rumblings in Egyptian and Babylonian cultures. Certainly great thinkers and writers existed in each of these cultures, and we have evidence that some of the earliest Greek philosophers may have had contact with at least some of the products of Egyptian and Babylonian thought. However, the early Greek thinkers add at least one element which differentiates their thought from all those who came before them. For the first time in history, we discover in their writings something more than dogmatic assertions about the ordering of the world -- we find reasoned arguments for various beliefs about the world. Of what does it really consist? And why can we describe them with a singular mathematics? And the method the Greek philosophers followed in forming and transmitting their answers became just as important as the questions they asked. The pre-Socratic philosophers rejected traditional mythological explanations for the phenomena they saw around them in favor of more rational explanations. In other words they depended on reason and observation to illuminate the true nature of the world around them, and they used rational argument to advance their views to others. And though philosophers have argued at length about the relative weights that reason and observation should have, for two and a half millennia they have basically united in the use of the very method first used by the pre-Socratics. Difficulties often arise in pinning down the ideas of the Pre-Socratic philosophers, and in determining the actual line of argument they used in supporting their particular views. This problem arises not from some defect in the men themselves or in their ideas, but simply from their separation from us in history. While most of these men produced significant texts, we have no complete versions of any of those texts. We have only quotations by later philosophers and historians, along with the occasional textual fragment.